Over the past 20 years, the use of maintenance technology, such as condition monitoring, has grown tremendously in the mining industry. In fact, its use has grown at such a fast rate that often technicians and reliability engineers aren’t sure what to do with all of the information being generated. Today, maintenance productivity and costs are well understood by mine management. These costs are a significant portion of the operating budget, making up as much as 20 to 50 percent1. As managers, we understand and pay attention to our key performance indicators. Mine owner-operators learned in the 1980s that maintenance planning and scheduling increases productivity, lowers costs, and makes mines safer. The earlier you can detect a problem, the more time you have to plan and schedule. Condition monitoring systems have been prevalent in the mining industry since the early 1990s. Mines now use a plethora of condition monitoring systems, including oil analysis, thermography, mobile asset health data, plant data historians, vibration, ultrasound, operator inspections and PM inspections. Condition monitoring can be defined as the use of technology tools to measure parameters or as inspecting equipment using the human senses to detect the problem. Yet, condition monitoring systems typically operate in silos. A huge amount of data is stored but, unfortunately, is not accessed or used in a way that the average technician can easily see or understand what useful information is there that can help prevent failures. When a piece of equipment fails, we often refer back to condition monitoring data to show what happened, instead of initially using the data to prevent the failure. In more than one mine, I’ve seen haul truck engines fail catastrophically, and shortly thereafter the equipment’s interface information is downloaded to see what happened. If that information had been recognized and acted on in the first place, the engine could have been saved. The theory of condition monitoring systems preventing catastrophic failure is a good one. However, mine owner-operators aren’t getting the results they expect. Mine management should be receiving regular reports on what’s being saved from proactive actions, not just standard breakdown and cost reports. From my experience in mining, technicians repairing failures aren’t being properly guided by in-house procedures or the company’s experts. Often, components are changed without any troubleshooting being involved, sometimes more than once. In other cases, newer, less-experienced technicians troubleshoot equipment problems to the best of their ability, but would benefit a great deal from knowledge captured from the organization’s seasoned experts. So it is imperative that we capture this expert knowledge while we can. Operator inspections often identify potential issues, but someone must translate this information and create a work order. Unfortunately, the complaint is often not legible. Diagram 1 is an example of an actual operator card. As you can see, it is almost impossible to read. The question is, with so many condition monitoring systems, along with visual inspections and planning and scheduling, why is so much new work discovered through failures? Are we planning and scheduling the right work? An asset performance management (APM) system brings maintenance systems performance and reliability knowledge together in one easy-to-view system. It collects online condition and operations data, as well as visual inspection data that users collect on operator cards or during routine preventative maintenance inspections. The system integrates with the mine’s computerized maintenance management system (CMMS) or enterprise asset management (EAM) system such as SAP, Oracle, Ventyx or IBM Maximo. Data that used to be sitting in thousands of columns and rows in many different systems can now be viewed centrally in one asset health dashboard. The data is trended, and can be consolidated, analyzed and measured. The information is actionable since the systems are now all connected and paper checksheets are now automated. No data falls through the cracks or is left sitting on a desk or in a database. See Figures 2 and 3.
i-models provide a rich engineering context for maintenance and reliability. Manager’s dashboard zeros in on what’s important at this level. APM isn’t just about looking at data. It’s about ensuring that we’ve properly identified the types of failures that could occur, recognizing that a failure is occurring, and knowing what can be done about it. This is where reliability-centred maintenance (RCM) and failure modes and effects criticality analysis (FMEA or FMECA) come into play. RCM is a strategy for achieving maximum equipment reliability and extended life at the lowest cost. An FMEA or an APM maintenance task analysis is performed on critical equipment, components or systems to put this strategy in place. The proven best-practice methodology for identifying potential reliability issues is through RCM by creating an FMEA or APM task analysis. It is a step-by-step approach to identify all possible failures on critical equipment and is used by Six Sigma. Once potential problems are identified through condition monitoring, work orders are sent from an APM into the CMMS with the data that created the indicator alarm and an attachment to the work order with an action plan. Work order statuses are sent back to the APM system to update the information. In this scenario, the APM system becomes the central control panel used as the main process driving proactive condition-based maintenance. For manual inspection, remote handheld units are used with states or numerical data that can trigger indicator alarms. Equipment inspectors in the field use APM mobile and remote applications to standardize the process of collecting qualitative and numeric inspection data and ensure consistency between inspectors. All of this information in one system makes it a powerful tool. I would not suggest opening a mine today without this process, and, when it comes to extending the life of existing assets, it’s the most costeffective way to succeed. Engineers need a visual environment with access to an asset’s engineering information so that they can compare to the design basis. This immersive environment has become a recent trend in APM. It enables inspections to become interactive. Hypermodeling and asset health modeling are also used to make smarter decisions. See Figure 4. Using an i-model built into the APM system, technicians, supervisors, or managers can initiate actions by clicking on an asset directly on the model. 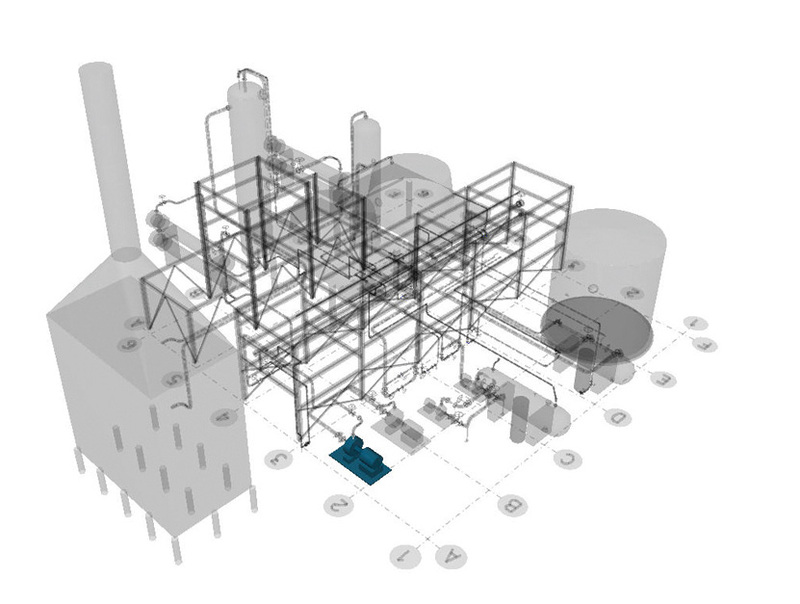 The i-model in this visual environment directly links to the asset condition indicators, enabling inspection indicator readings to be associated with the visual model. The asset can be opened using the i-model to see relevant details such as specifications, work or failure history, or a graph of the condition degradation. Moreover, with spatial navigation of assets, you can see assets in a particular area in early warning alarm by type of problem or type of asset, then drill down to the asset’s i-model or take action directly from the map. An APM supervisor dashboard app is invaluable. It reduces some of the reliability and maintenance managers’ worries on or off site by providing an at-a-glance, actionable, 24×7 view of asset health and key performance indicators (KPIs). Role-based dashboards are also extremely valuable because they let the manager, engineer or technician see just what is important to him or her. In the examples below of an area supervisor’s dashboard, the supervisor may want to see all indicators in alarm in his or her area at a glance every morning and a quick view of his or her critical KPIs. The manager might choose to view outcome KPIs, cost avoidance savings, and maintenance cost per ton. Today, dashboards are easily configurable without IT support. What does APM mean for mining? Mechanical and electrical expertise is in demand in mining around the world. Mining companies are sometimes afraid to invest in training technicians for fear that if we train them, they will leave with their knowledge. When good technicians retire, their knowledge of the assets they worked on is lost. A best practice today is to document their expertise in an APM system. But don’t stop there, don’t just document it. That would be like leaving the RCM analysis results sitting on a shelf. There’s much more to an APM system in terms of implementing the reliability programme and managing all the data that comes from implementing the programme and monitoring asset health on a day-to-day basis. APM systems are setting a new standard for managing assets in the mining industry, and they should be mandatory in all mines. When establishing a new mine, the time to begin a reliability programme is when the equipment is first received. Baselines can be created in the initial stages of startup. Failure modes and job plans should be created and available at a glance. Those operating an existing mine should think of APM as the most costeffective strategy for extending the life of aging assets. They should view APM as the best way to get more from existing assets while reducing costs, cutting fleet numbers, and, at the same time, getting more production. APM is also aligned with ISO 55001, the new standard for asset management. This new standard is the way of the future for the sustainability of mining operations. In short, APM ensures that the mine’s assets are delivering value, not hurting the business.